OK, so my last two posts were a soup (albeit a very fresh and bright soup) and lasagne to warm up my northern hemisphere friends. 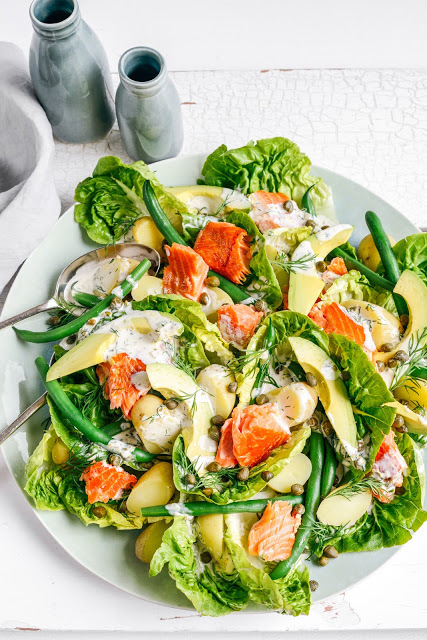 Today we’re back in the southern hemisphere with a super summer salad that I made for Fairfax to share. This is pretty much summer on a plate, perfect for the unbelievably beautiful, hot, sunny weather we have been experiencing. 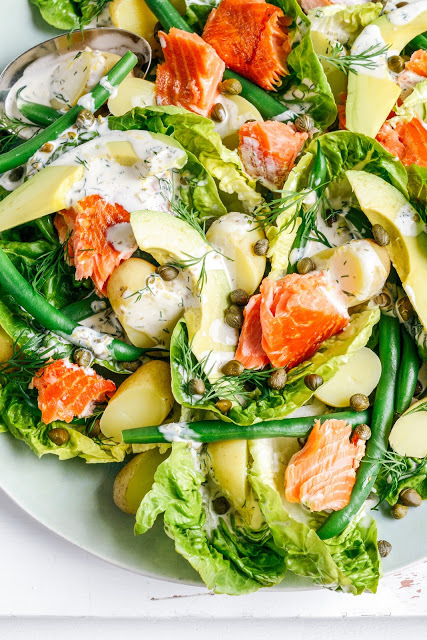 The salad creates an entire meal, complete with leafy greens, crunchy freshly blanched beans, creamy avocado, starchy new potatoes and rich hot smoked salmon, and the dressing is all zingy with plenty of capers, lemon and dill and a little bit of garlic grunt. If any Aussie or New Zealand farmers or firemen out there are reading this (you never know!) good luck for handling the remainder of this heatwave around our countries, and from someone who has had a melanoma (me) please all you lovely beach-goers, don’t forget to be sun safe!!! Have an awesome week…mwahahahaha where will we be next time? I could eat this gorgeous salad, every single day! Found you on Pinterest — made this gorgeous salad last night for a dinner party and it was a huge success. Added some asparagus since it was in season otherwise just as you suggested. The dressing was wonderful, might use it some other time on a potato and egg salad. Looking forward to trying more of your recipes. I used different proportions because of what I had in the kitchen, but I still have to say this is one of the best things I have ever put in my mouth. And that includes cake. Heck, that includes some of the top restaurants in Helsinki. The only downfall of the recipe is that it requires my husband to smoke salmon the day before and then not eat it all. Truly scrumptious Sarah, halved the recipe and there was still enough for us both for lunch next day. Also substituted some more yoghurt for some of the mayo as I'm doing rather well on the old healthy eating regime. Trying your recipes is making it so much easier to stick to my good intentions! The only thing I would have to say is that using the recipes from a smartphone is a bit of a nuisance as the screen keeps going off every few minutes, a recipe book filled with all your beautiful photography and recipes would be the perfect fix for that please, you'd make millions! Have you ever thought of this? Please? Hi Hannah – well that was perfect timing! I am planning on publishing a cookbook next year and am meeting with a distributor on Monday – may I use your comment as a quote example for them!? That's fabulous news! I will definitely, definitely will be buying a copy or six, how exciting! Of course you can use my comment, how very flattering, thank you! I don’t have a smoker. Can I use loxs?